The city-state’s two largest lenders both boosted loans by 18 percent last year, even as regulators cooled the housing market. DBS and OCBC are countering slower growth at home by expanding. The risk is that rising interest rates could test the wisdom of that strategy. 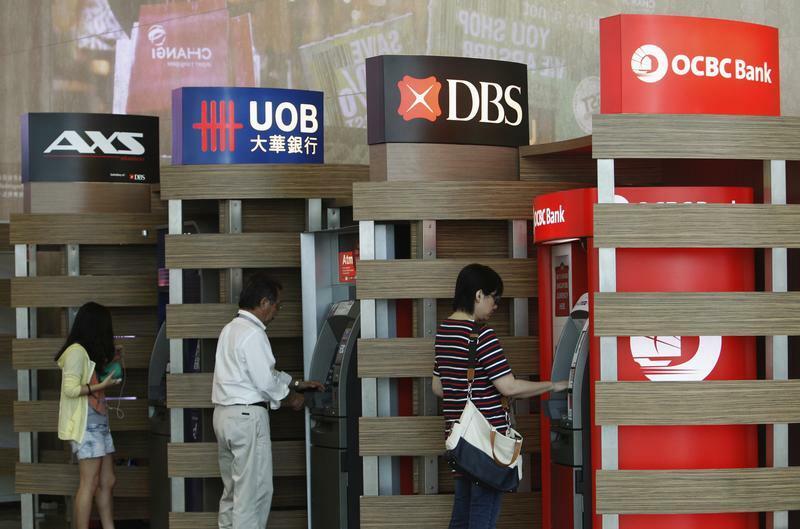 People withdraw money from United Overseas Bank (UOB), Development Bank of Singapore (DBS) and Oversea-Chinese Banking Corporation (OCBC) automated tellers in Singapore May 17, 2013. DBS and Oversea-Chinese Banking Corporation (OCBC) both reported financial results for the year ending Dec. 31 2013 on Feb. 14. DBS reported full-year pre-tax profit of $4.5 billion, down 3 percent on the previous year. The decline was due to bad debt charges, which rose by 85 percent to $770 million. However, non-performing loans fell to 1.1 percent of the bank’s total loan book. The bank’s net interest margin fell to 1.62 percent, from 1.70 percent in the previous year. Total gross loans were $252 billion at the end of December, up 18 percent year-on-year. OCBC reported pre-tax profit of S$3.57 billion ($2.82 billion) for 2013, down 28 percent on the previous year. After excluding a one-off gain on the sale of an asset in 2012, pre-tax profit was down 2 percent. Total loans at the end of December were S$170 billion, up 18 percent year-on-year. By midday in Singapore, DBS shares were down 0.7 percent at S$16.4 each, while OCBC shares were down slightly at S$9.32 each.